Imran Khan has been around for decades. From cricket to politics, his life has always been open for us to see. 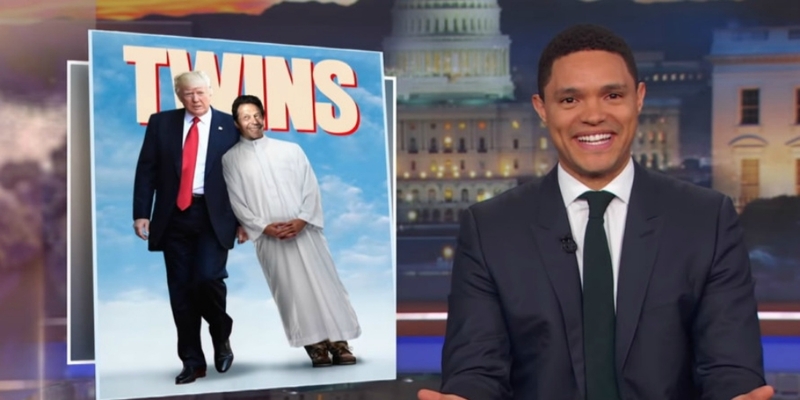 So when Trever Noah, host of The Daily Show, did an entire segment on the similarities between Donald Trump and Imran Khan, people were very shocked. PTI supporters did not waste a second in replying to the video clip, denying the similarities between the two. I’m actually inclined to agree with Hamid Mir here. Trevor Noah is a comedian. His show is light-hearted and designed to give everyone a laugh. It’s not gonna hurt Imran Khan’s image at all. However, not everyone thought about it the same way. People against PTI were quick to share the video in an attempt to defame Khan. Bakhtawar Bhutto hails from PPP (obviously) so it is only natural she’d try to badmouth Khan however she can. However, saying that he defends terrorists is very hypocritical on her part because Zardari has been known to welcome all sorts of shady people into his party with open arms. Trevor Noah is a comedian. When he compares Imran Khan to Trump, it’s a joke. It was made for the pleasure of the audience and to get a laugh. There’s no need to swear at him for making a Pakistani look bad. We Pakistanis know our self worth and it can’t be determined by what an American (who is a comedian) says about us. Love @Trevornoah Love @TheDailyShow but this piece misses the mark. Imran Khan is the kind of leader the Pakistani Population needs. A country where every civilian government had been over thrown and the last Prime Minister is currently in Prison. The entire point of this piece was to give the US population a bit of humor by comparing Trump to someone who wasn’t American. I don’t understand why people are taking this so seriously. Imran Khan will become our Prime Minister regardless so why does anything people say at this point even matter?